Cork Graham checks the sights on his M&P15. 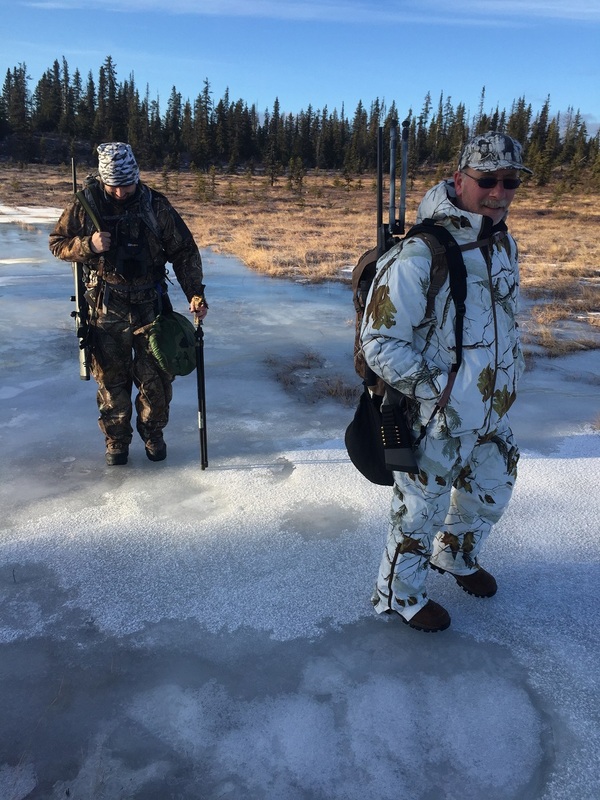 It never ceases to amaze me how many hunters are so ready to jump at the chance of a moose or caribou hunt, but aren’t as enthusiastic when the subject comes to predators like bears, wolves and coyotes. Everyone looks forward to the antlers, the meat, possibly the hides, but often, aside from bears, most won’t bring the meat home from a wolf or coyote. But, it’s not about just taking meat home, it’s about giving back to the moose and caribou populations we Alaskans are lucky to enjoy, and whose flesh we thrive healthily on. It’s about common sense and doing our best to keep balance in a world in which human encroachment has overtaken so many areas of the world’s wild areas. Wildlife management is well-orchestrated in Europe, but in the US, many still hold to fantastical utopian idea of the natural world in which humans are only voyeurs. Active participants, that we have been since our early years as primates in an ancient savannah, our taking of not just ungulates but their predators is just as important as it was hundreds of thousands of years ago to our ancient ancestors, who hunted competitive species with spears, bows and arrows and fire, like wolves, mountain lions, and bears. With this in mind my friends Steve Entringer and Eric Stanley headed forth into the frozen muskeg near my home, on a cold but sunny morning. As we worked our way across the ice, sometimes bare ice, that would easily send a pedestrian to the ground, hard, after an unlucky slip, we arrived at a log jam, leftovers from the major spruce beetle kill that devoured large healthy spruce twenty years ago. Warm and cradling the foot, with Vibram Masai sole that seemed to add to the traction on the slippery ice and snow, the LOWA Hunter GTX Evo Extreme were earning their keep quite well, since my introduction to them on a bear and deer hunt in California earlier in the year. Dead spruce stands as a reminder that human non-interaction is not as benign as the ignorant think: had logging been permitted early, instead of late, the swaths could have been cut through the major forests that covered the Kenai Peninsula and prevented such a major disaster—I will be dead long before the spruce will be the size they were when I last lived in the peninsula in the early 1990s. Entringer and Stanley keep an eye out for Wiley Coyote and Mr. Wolf. 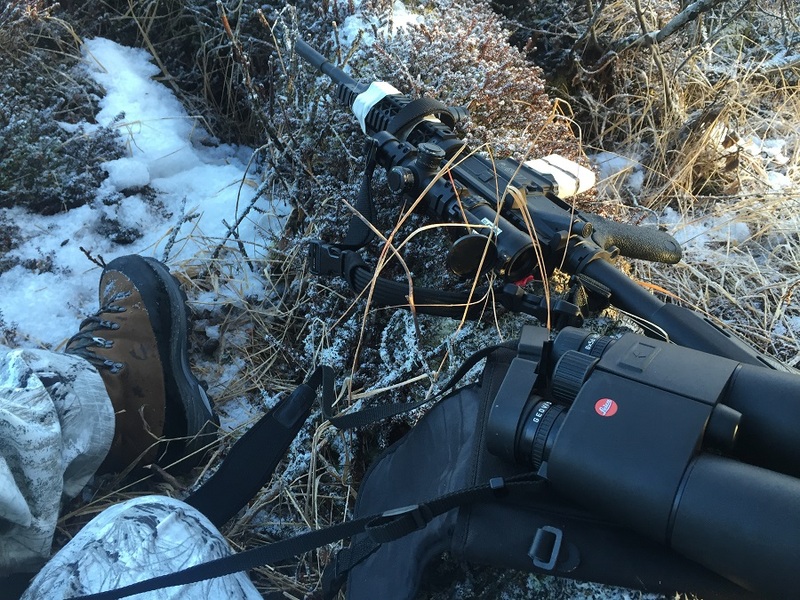 There are two excellent techniques for hunting wolves and coyotes: getting on top of a hill and spotting wolves with good optics; sitting in a likely area of travel and calling with a call imitating either prey or a competing predator. Entringer had brought a FoxPro electronic call, which had not only raven and magpie bird calls, rabbit screams, various coyote calls, but also the rendition of wolves on a kill. 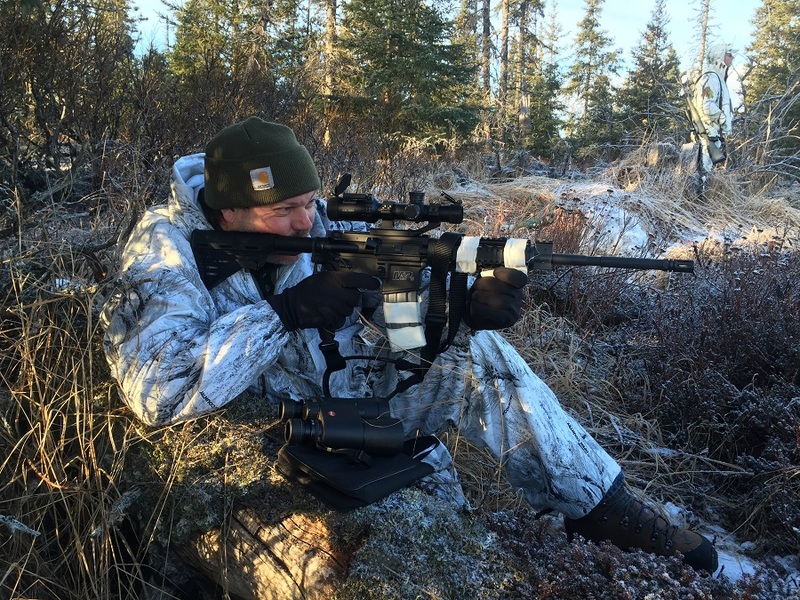 Armed with an M&P 15 .223, and a .243 and .260 Nosler in bolt-action rifles, we took our vantage point and looked out over the mixture of spruce, birch, willows and wide open muskeg. When calling coyotes, the rule is pretty much to call for 15 minutes and then move on if you haven’t seen anything. 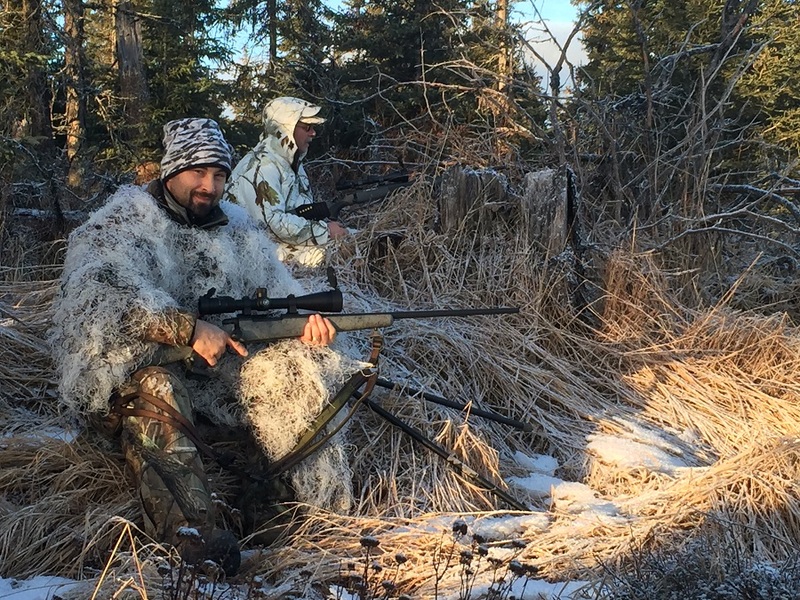 Targeting wolves, it’s better to call a little bit longer, say up to 45 minutes. While the objective during the calling of coyotes is to make it look like there’s an easy meal, often the caller going after wolves is appealing to the pack and territorial attitude of Canis lupus. Starting with a call to coyotes, Entringer appealed to the insatiable hunger of one of the most prolific predators in America. First, the scream of a snowshoe hare. Then the call of a victorious coyote, rallying his brethren to a fresh meal. Finally, the cackling of magpies, flying in to scavenge the imaginary kill. Then silence…Bringing my Leica 8X56 HD-R Geovids up to my eyes, I scanned the tree line on the other side of the frozen muskeg. Fifteen minutes later, Entringer initiated the coyote howl and I heard the tiniest movement behind us. I couldn’t pick it out. I would later realize that it was a coyote, fox or lynx making the sneak in from behind—track was hard to find as the snow had mostly melted and what was left was frozen hard as concrete. We tried the rally wolf howl, and it got the response of a wolf far in the distance, but we just couldn’t get the wolf to come in. It was too bright of a day, and not cold enough of a temperature to get the predators going on the prowl earlier than that evening’s twilight. After putting in an honest 45 minutes that should have had a coyote, wolf, or even a large brown bear (another winter of unseasonably warm weather was bringing the bears out of their dens early), called it a day at that site. I had to get back to a new book I had to complete writing before I would be leaving the United States on assignment again, so I didn’t have the time to check out another site. Entringer and Stanley drove their pickup to another place, but wolves and coyotes were just not in the offing that day.